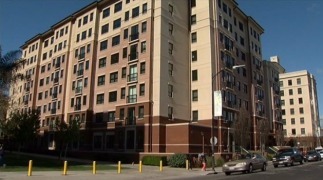 File image of a San Jose State University dorm building. One San Jose State University football player is in the hospital and another is suspended after a fight in a dorm. University police say Chad Miller, a redshirt freshman safety, was hospitalized after a fight Tuesday night inside Joe West Hall, an on-campus dorm. His condition has not been revealed. While campus police investigate, school officials aren't identifying the other player involved in the altercation. Miller took a redshirt as a true freshman last season, NBC Sports reports. He’s listed as the No. 2 free safety on the most recent depth chart. Tuesday’s fight comes only days after another player was kicked off the team after officers arrested him for battery.